Forest Hill （森林山） 从地理位置上又分为Forest Hill North 和 Forest Hill South. Forest Hill North 位于C04区，而Forest Hill South处于C03区。Forest Hill North 是指东西介于 Allen Road 和Latimer Ave. ，南北介于 Eglinton Ave. West 和Briar Hill Avenue之间的区域。见下图中粉色区域. 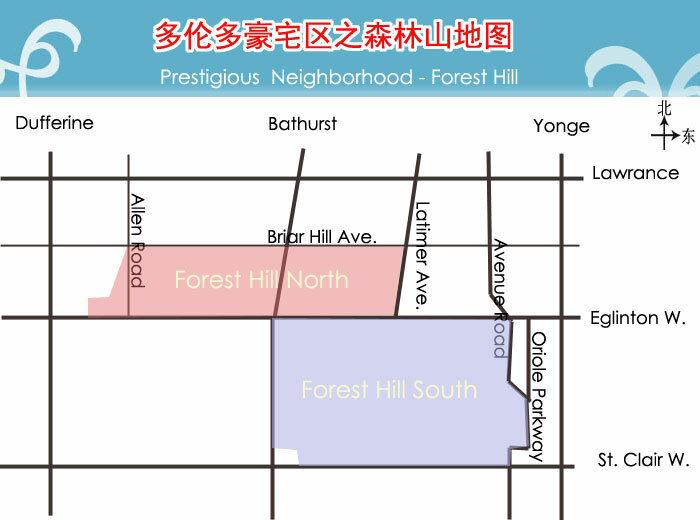 Forest Hill South 是指东西介于Bathurst St.和Avenue Road/ Oriole Parkway，南北介于Eglinton Ave. West和St Clair Ave. West之间的区域. 见下图中蓝色区域.